Bettinsoli shotguns perfectly intertwine traditional gun making techniques with modern technology to provide state-of-the-art weaponry. With fantastic attention to detail and stylish exterior, Bettinsoli have a reputation for producing beautifully-crafted but inexpensive shotguns. A well-established Italian manufacturer, Bettinsoli offers a wide range of sensibly-priced shotguns to all levels of expertise. At Guntrader, we list over 200 new and used shotguns for sale, ensuring that you will always find what you are looking for. Bettinsoli diamond 12G over and under shotgun. Condition as in photos. Used by my partner as her gun however is upgrading and no longer needs this and no space to keep unfortunately. This has not had heavy use and is clean and tidy. Beautiful Bettinsoli X Trail Game in .410 with 30" barrels. 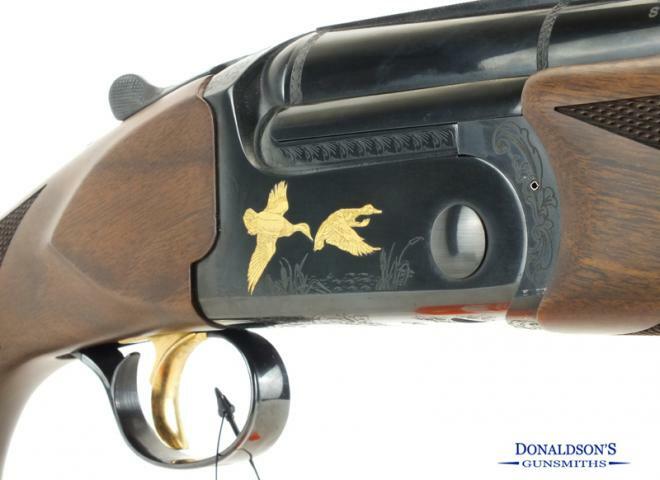 The boxlock is tastefully engraved with gold highlights on the birds in flight and the trigger guard. Multichoke gun with quality Italian style and finish at an incredible price. Beautiful Bettinsoli X Trail Silver in 20g with 32" barrels. Multichoke gun with quality Italian style and finish at an incredible price. This is a second hand Xtrail Junior 20bore from Bettinsoli - the Xtrail Junior Sport 20 gauge with a shortened stock and 26" multi choke barrels is a great choice for a youngster or lady to begin their shooting careers with. A great condition used Bettinsoli Mk3 Sporting. Silver receiver with game scene engraving. Great all rounder - quality Italian made over and under. Pre owned Bettinsoli 30" X Sport T16 with slightly raised rib, still with the original box and all accessories. Attractive new Bettinsoli Diamond X Grade. Well figured and attractive walnut with Silver receiver with inset gold bird detail. Well made and finished this is a quality well priced Italian built gun. New Bettinsoli 30" multichoke sporter. The X Trail is a best seller in the Bettinsoli range for goood reason. Attractive case colour hardened reciever, steel proofed with manual safety. The Gun Room offers you the opportunity to purchase a new Bettinsoli X-Trail Junior with 26" multi choked barrels. Comes cased with additional chokes. Excellent quality for the price, it's well made, points and balances nicely, moves easily and comes with ABS travel case containing choke tubes and key. Mint Condition, Sport With Makers ABS Case and 5 Chokes and Key, Adjustable Stock. C/W makers plastic case & 3 spare chokes, few small marks on stock but action in as new condition. Pre owned Bettinsoli 20G and ideal lighter weight field gun or starter gun.